UNITED NATIONS, February 1 -- With accountability for Bashar al Assad a matter of debate in the UN Security Council, a protest press conference about Yemen has been called for February 2 in front of the Ritz-Carlton Hotel on Manhattan's Central Park South, where the organizers say Ali Saleh is staying. Inner City Press asked German Minister of States, after Tuesday's Syria meeting in the Security Council, if his speech's reference to crimes against humanity meant opposition to Assad getting the same type of immunity deal that Saleh has received. "It's too early to say," Link replied. 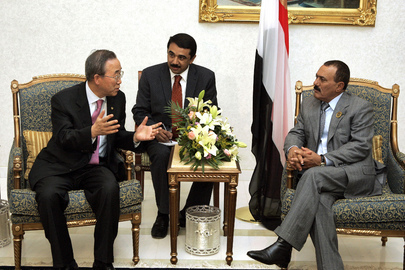 Inner City Press on February 1 asked US Ambassador to the UN Susan Rice about the protesters' report that Saleh is staying in the Ritz-Carlton, with a security detail of 35 officers. Rice insisted that Saleh is only in the US for medical treatment -- inconsistent with a stay in a luxury hotel -- and said that his security is a matter for local authorities. Some are questioning if NYPD is providing protection, amidst a scandal of "profiling Muslims." That too, the organizers say, will be addressed at the press conference. Watch this site. Footnote: Human Rights Watch is said to have "flip flopped" on the propriety of Saleh's stay in the US "it was 'appalling' that Saleh would get first-rate treatment in the U.S. while hundreds of Yemeni victims are not getting proper medical care or justice." Then, after who knows what push back or (non) communications, HRW said it is "not opposed to Saleh receiving care in the United States." In a hotel?